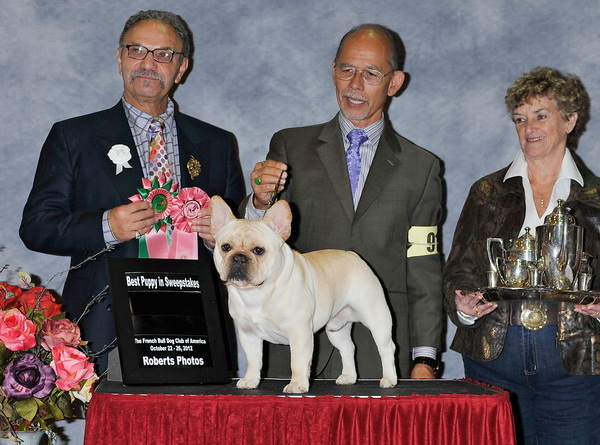 24 Nov 2012 American Grand championship is awarded to Gch.Napachai Hilsman Throw Caution to The Wind, aka Carson (Litter brother to Sebastien). This is the first grand champiom french bulldog bred by a Thai as well!! Oct 2012 Best of Sweepstakes at FBDCA Nationals 2012, Portland, USA CAN.CH.HILSMAN NAPACHAI CRUEL INTENTION, aka Sebastien! He is the first Thai bred french bulldog ever to win such the award at FBDCA Nationals!